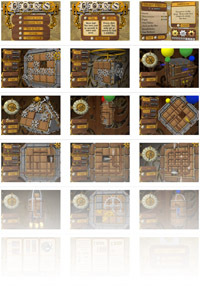 I just went through the process of upgrading Cogs to take advantage of the new capabilities of the iPhone 4. Since I had such a tough time getting everything working on all of the iOS platforms, I figured I'd make a list of my changes to help out other developers who have built apps based on Apple's OpenGL ES example. So, you've always had a passion for games. Now you have a few CS or art classes under your belt and you're serious about getting into the indie game development scene. But what's the next step? Allow me to recommend a game jam. What's a Game Jam? Every jam is a little different, but in general, it's an opportunity for a diverse set of game developers to come together in one place and make game prototypes during a 24-48 hour time window. Most jams cater to all skill levels. In most cases, teams of 4-6 members are randomly chosen at the start of the jam in a way that insures that each team has at least one experienced programmer and one artist. Cogs Wins Indie Game Challenge! 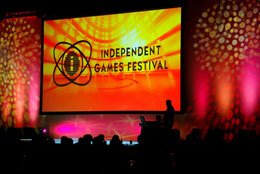 It had already been an amazing year for Cogs with award nominations at IndieCade and the Independent Game Festival. But our weekend in Vegas for the Indie Game Challenge really took us by surprise. It was an honor just to be named as a finalist from the more than 250 games that entered. Winning three of the awards, including the grand prize in the professional category, left me, Brendan and Luke grinning ear-to-ear as we held up a six-foot-long check for $100,000. Read more about Cogs Wins Indie Game Challenge! Read more about Cogs Launches on iPhone! Last night at 9:00 Pacific the Independent Games Festival (basically the Sundance of the game industry) announced the finalists for their 2010 main competition. We are both excited and honored that Cogs has received a nomination for Excellence in Design. To be selected out of such a record number of entries is truly mind-blowing. 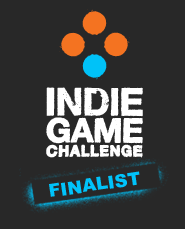 Congratulations to all the other finalists, we'll see you on the show floor at GDC! While everyone else is after your dollar this holiday season, why not treat your PC to a FREE gift that keeps on giving? We wanted to do something with all of the cool art assets that we created for Cogs, so we figured we'd create a nice gift for our fans. You can download the installer here.